This is a funny and serious article in the New England Journal of Medicine about consumption of chocolate and Nobel prize winners . 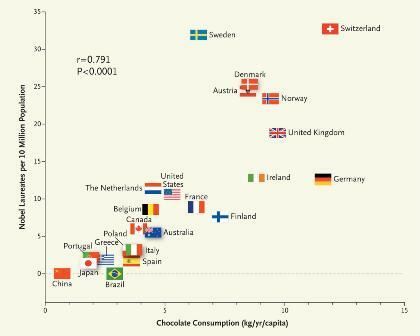 The more chocolate was consumed in a given country, the more there were Nobel prize winners. Sweden was the exception, but there is where the Nobel prizes are handed out, so they may have been biased.